While we usually talk about the best feng shui bedroom colors as creating calm and harmonious feng shui energy in the bedroom, are you ready to accept that this bedroom, too, has excellent feng shui? Full of wood and fire feng shui element colors, this bedroom has excellent energy - crisp, fresh, vibrant, happy. Especially good feng shui decor for a person with the fire birth element energy. 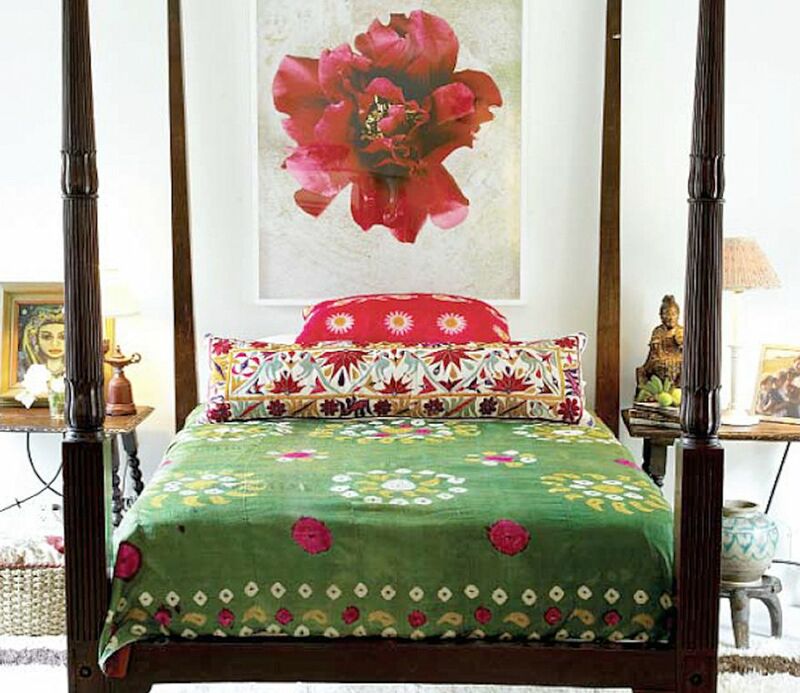 Notice the abundant presence of both wood and fire feng shui elements in the stunning sensual energy of the blooming flower art as the focal point of this bedroom, the most vibrant magenta red accents in the bedding, the yellow color touches (all expressions of the fire feng shui element energy). The wood feng shui element is expressed here in the most beautiful green color bedding, the deep wood frame of the bed and the various surrounding details. Notice the abundance of white color (metal feng shui element) in this bedroom. Without the freshness and clarity of the metal element, this bedroom could easily feel overwhelming. This bedroom photo shows well the colors that are considered best feng shui for a bedroom. A warm feeling of cocooning, nourishment, earthy sensuality and calm simplicity is created by the warm earthy tones of the rug, the drapery around the bed, as well as the ceiling color. This creates a good balance with the soft colors of the bed linens and is all grounded well (feng shui-wise) with the color of the art frames. A touch of fresh ​green brings just the right energy to this calm, cozy and peaceful bedroom. Any feng shui touches to add to this bedroom? We feel content just by looking at it, and imagining a wood fireplace doing its magic on a cold winter night! One tip for sure - while the framing of the art is absolutely perfect, the choice of art is not the best feng shui bedroom art. Great Feng Shui Bed. Notice the upholstered & padded headboard in the most soothing pink color, the luxurious bedding, as well as the height of the bed. Soft & Feminine Bedroom Decor. The window treatment, the rug, the sculptural base of the lamp, the beautiful white coral decor element and the small flower in a vase - all these elements create a sensual flow of nourishing yin energy. Balanced "Yin-Yang" Look and Feel. The trick to the excellent feng shui of this bedroom is the presence of the metal feng shui element, which brings a balancing masculine energy. You can notice this in the shapes on the beautiful nightstand, the subtle pattern, and color of the wall treatment, as well as the brass detail of the bench. This creates a sense of comfort and luxurious enjoyment of this bedroom. Is there any feng shui addition needed in this beautiful bedroom? We would suggest several decor elements in the earth feng shui element colors, such as light sand, beige or deep chocolate color. An Impeccably Balanced Bed. Balance is always good in the bedroom, and this specific bedroom creates an almost mirror-like reflection of each side: identical light fixtures, nightstands, art, etc, but with subtle variations. Stable, Wide Headboard. The stability and width of the headboard is emphasized by the rich leather material and color, excellent feng shui backing and support. Good Feng Shui Colors. Best feng shui colors for a bedroom are the so-called skin colors, and we know that skin colors vary from pale white to deep chocolate tones. Is there anything we would like to add to the feng shui of this bedroom? Yes, definitely. Little details to bring more feminine (​yin) energy by adding soft elements, such as fabric in an unexpected free-flow pattern will create more softness and feminine flow in this bedroom. Adding fire feng shui decor elements will balance the strong wood and metal feng shui elements present in this bedroom. Excellent Feng Shui Headboard. This is considered the best shape for a headboard because it is conducive to a harmonious exchange of energy between partners. It is also padded and soft (yin/feminine energy), but in a masculine (yang) color. Crisp, Fresh Energy. You can​ feel this bedroom has fresh energy: no clutter, tons of natural light, clean, clear and soft energy. Good Bed Cushioning & Protection. Notice the placement of the big light fixture in between the bed and the window, as well as the soft window treatment. These decor elements add a sense of protection to the nourishing and comforting energy around the bed. Good Feng Shui Bedding. This is obvious, isn't it? Fresh Flowers. Contrary to the popular belief, a small bouquet of fragrant flowers in the bedroom is excellent feng shui.